James Hopkins Obituary - Haileybury, Ontario | Buffam Leveille Funeral Home Ltd.
Jim passed away peacefully on October 1, 2018 at Temiskaming Hospital at the age of 83. Born in Porquis Junction in 1935 to Chester and Gertrude Hopkins, Jim also spent part of his childhood in Sudbury before the family moved to Haileybury, where he has lived ever since. 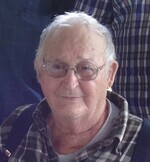 Jim was a Journeyman Industrial Millwright at Rexwood for many years. Jim was well-known for his cabinetmaking and woodworking, his chickens and exotic birds (Lakeview Fowl Trust), his carving and his gardening. Jim loved to talk to people and to teach them as much as he knew, and his love for learning continued his whole life. Jim was predeceased by his parents, Chester & Gertrude Hopkins, by his daughter Debra Duquette, by his brother Josias Hopkins, by his sister Dorothy Huff, by his brother-in-law Dudley Huff, by his brother-in-law Ogden Porter. Jim is survived by his wife of 63 years, Marilyn (née Conroy), his son Herb (Correen) of Kelowna, B.C., his daughter Karen Ross (Lorne) of New Liskeard, and his sister Helen Porter. He will be greatly missed by his grandchildren Herb & Corey Hopkins, Graham and Craig Ross, and his great-grandchildren, Evan and Calli Hopkins. A memorial will be held in 2019. Cremation has taken place, arranged by Buffam Léveillé Funeral Home. Donations may be made to the Kidney Foundation.